Lucky you! Not only have you been privileged with a once-in-a-lifetime window into Sub-vault #1 at The Condiment Bible storage facility, you're witnessing quite possibly the last four remaining bottles of Billy Bee Prepared Honey Mustard in the Western Hemisphere! 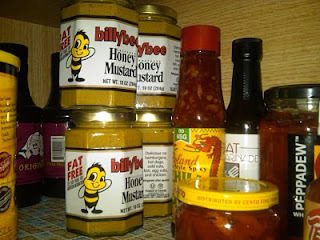 Unfortunately, Billy Bee discontinued their restaurant-style Prepared Honey Mustard (in the glass jar) in early 2010. It was one of the few sweet-style honey mustards available, and it was amazing on chicken tenders, french fries and just about any cold cut sandwich. If you're lucky, you might be able to find some jars still left on grocery store shelves.